The community of huge alga, Sargassum carpophyllum J.Agardh, which is up to 7.4 meters tall. In Oura Bay of Nago on April 9 2013. A huge marine algae community up to 7.4 meters tall was found in coral reefs in the reclamation area of Oura Bay in Nago. 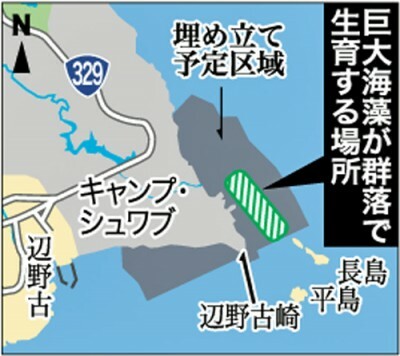 The U.S. and Japanese governments plan to build a new base in the area to replace U.S. Marine Corps Air Station Futenma. A diving team consisting of doctoral research fellow at the University of Ryukyus Takuma Fujii and former assistant professor at Tokyo University of Marine Science and Technology Hideo Oba discovered the marine algae community on October 2. 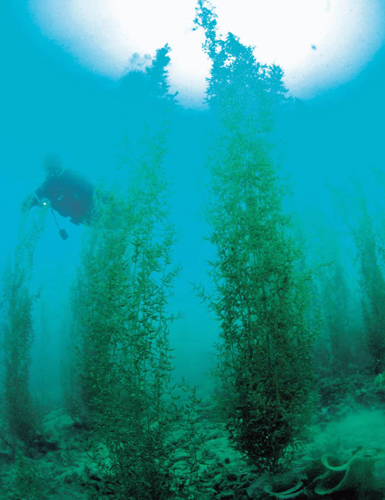 Marine algae communities measuring over three meters tall, have been found only north of Kyushu. The huge marine alga which grows in clusters in Oura Bay is Sargassum carpophyllum J.Agardh ranging from Okinawa to the Seto Inland Sea. The highest alga of this kind was 1.5 meters. This is the first time in the world the alga which is 7.4 meter high, has been found. Location of the huge marine algae community. The team found the algae community in the waters 50 to 100 meters away from shore in the northeastern area of Henokozaki. It is growing in clusters intermittently at depths of 10 to 20 meters. The reason the algae grew so big is unclear.